New Hall Vineyards01621 828343work VineyardNew Hall Vineyard is an English Wine Producer with over 65 hectares of vines and is one of the oldest and largest in the country. It was first established in 1969 by the Greenwood family, in the Essex village of Purleigh, and is now run by second and third generations. The Greenwoods decided to plant the vines after learning that an historic vineyard was planted just 500 yards away at the local church; wine produced from the grapes was especially selected to be drunk during the Magna Carter celebrations. The grape vines grown at New Hall were carefully selected and have been planted only 12m to 24m above sea level, on well-sheltered, southern facing slopes of a shallow valley. Over the years this site has proven itself to be an almost ideal place, for the growing of vines in England, producing, above average crops of high quality grapes with naturally high sugars, each year. New Hall lead the way in planting Bacchus in the early 1980'2; they've now become East Anglia's signature grape variety and the source of many international wine competitions. In 2013, 2015 and 2016 New Hall vineyard was awarded the UK's Winemaker of the Year, a great national achievement. In addition, 2015 and 2016 saw New Hall win over 40 national and regional Trophies, SiIver & Gold Awards for their wines and wines produced by them on behalf of other vineyards. 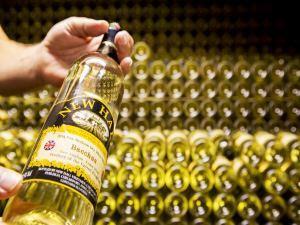 New Hall holds one of the largest collections of Wine Awards in the country. New Hall Vineyard is an English Wine Producer with over 65 hectares of vines and is one of the oldest and largest in the country. It was first established in 1969 by the Greenwood family, in the Essex village of Purleigh, and is now run by second and third generations. The Greenwoods decided to plant the vines after learning that an historic vineyard was planted just 500 yards away at the local church; wine produced from the grapes was especially selected to be drunk during the Magna Carter celebrations. Group tours and tutored wine tastings run in Spring and Summer and should be booked well in advance. Always fun and informative, the tours last for 2 hours and enjoy a very generous tasting, interactive tour and cheese platters piled high! Our Railway Barn, Tasting Shed and newly-renovated Stables are available for private hire, weddings, parties and corporate events. The Cellar Shop is open Monday-Friday 9am-4pm and Saturdays 10a,-2pm for free tastings.